Evelyn Jarvis was born July 26, 1896 in Vicksburg, MS. She was the oldest of three children born to Frank and Blanche Jarvis. After the death of Frank Jarvis, the family migrated to Chicago where Evelyn completed grammar and high school. She was brought up in a stern, religious household but Evelyn convinced her mother to allow her to pursue a career in acting. Vaudeville provided her early training as a performer. Evelyn changed her surname to Preer and in 1919, she landed a role in filmmaker Oscar Micheaux’s debut film The Homesteader. 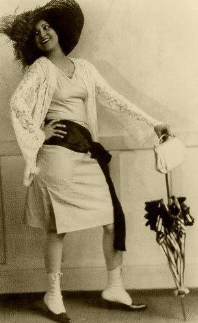 As his premier leading lady, Micheaux promoted her with personal appearance tours and star-making publicity. 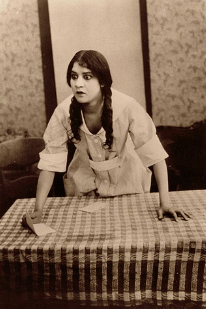 Impressed with Evelyn’s talent, Micheaux cast her in several more films, including the controversial Within Our Gates (1920), The Brute (1920), The Gunsaulus Mystery (1921), Deceit (1923), Birthright (1924), The Devil’s Disciple (1925), The Conjure Woman (1926), and The Spider’s Web (1926). 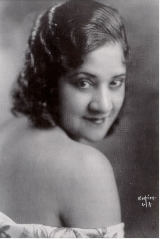 Ms. Preer joined the esteemed Lafayette Players, the first professional Black theatrical stock company and in 1924, married fellow Lafayette Player, Edward Thompson*. Preer and Thompson became a formidable leading duo, frequently headlining productions for the traveling faction of the Lafayette Players. Along with the staging of Shakespearean and Broadway legitimate dramas, Ms. Preer starred in such mainstream classics as Oscar Wilde’s Salomé, Within the Law, The Yellow Ticket, The Cat and The Canary, and Anna Christie. In 1926, she had a successful stint on Broadway in famous director-producer David Belasco’s production of Lulu Belle. In 1928 Preer won further acclaim as Sadie Thompson in a revival of Somerset Maugham’s Rain. Through friendship with filmmaker and actor Spencer Williams, Jr., Evelyn went on to star in four black cast shorts: The Framing of the Shrew, Melancholy Dame, Oft in the Silly Night and George Rose. It wasn’t long before White Hollywood jumped on Evelyn’s bandwagon, but many times she was either turned down for roles or her scenes were cut because of her fair complexion. Often Evelyn and her husband, Edward had to wear make-up on screen to darken their skin so the audience wouldn’t think they were white. In April 1932, Preer gave birth to her only child, Edeve. Sadly, only months after her daughter was born, at the age of 36, Evelyn Preer died from double pneumonia. The African American Registry reported, had she not died prematurely, Evelyn Preer might have been the much-needed Black “crossover” leading lady and icon on Broadway and in Hollywood. Given the racial climate and restrictions on Black actors, the light-complexioned Evelyn Preer still emerged as a pioneer Black female performer in race film and dramatic theater. *Note: some modern sources indicate that Evelyn Preer was married to Lawrence Chenault rather than Edward Thompson. This entry was posted in Artist Spotlight and tagged Birthright, Black Actress, Deceit, Edward Thompson, Independent Race Films, Lawrence Chenault, The Brute, The Conjure Woman, The Devil's Disciple, The Gunsaulus Mystery, The Homesteader, The Spider's Web, Within Our Gates by blackcinemaconnection. Bookmark the permalink. Hi! Thank you for this article. I’m looking for the original versions of these images of Evelyn Preer, do you know where you got them from? Hello Aiko. Images were obtained from Pinterest and/or sources referenced in the post. Please check out my Black Cinema board on Pinterest for more images of African American actresses and actors of classic cinema.